This Friday the Lady Water Warriors compete at their final meet of the season, the State Championships. Last weekend the team finished in second place at A-League and they have high hopes to finish as strong this weekend at State. With one final meet left, we sat down with two seniors who have qualified for state to talk about their final high school meet. Emily Abernathy ready to dive off the block. Senior and swim captain Emily Abernathy qualified in the 200 Free (1:58.56) and the 500 Free (5:13.99). When asked about what high school swimming has taught her, she responded, “High school swimming has taught me how important camaraderie is. These girls have become my sisters and I wouldn’t swim as fast as I do if I didn’t have that love and passion for my teammates”. 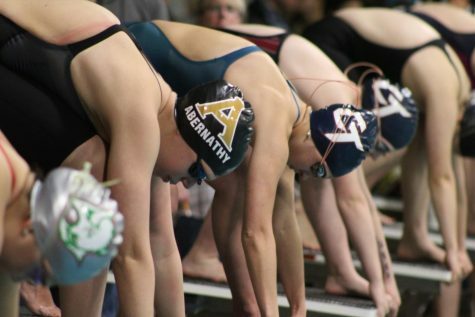 When asking Emily about what she will miss the most about Arapahoe Swimming, she said, “I’m really just gonna miss all these girls. I’ve created a relationship with all of them and I hold each of them close to my heart, and I’m really going to miss them”. 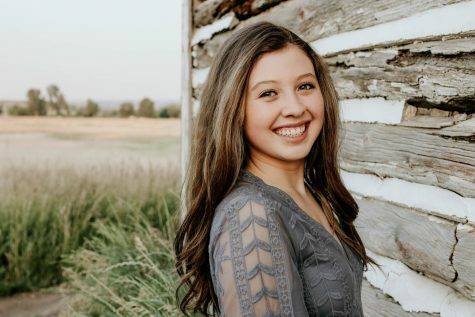 Emily will continue her swimming career next year at Colorado Mesa University and is looking forward to beginning her college experience swimming with a new team and making new friends. Kirry Belitz diving at A-League. Kirry Belitz, dive captain, and state qualifier is incredibly focused going into her final competition. 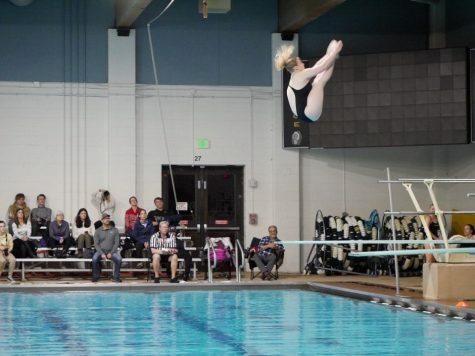 When asked about how she has mentally prepared to go into the state competition she responded, “My thoughts going into state are just focusing on my dives and making sure that I don’t get more stressed out than I need to be. Mentally, I’ve been trying to keep positive and push through the doubts that I have. I try not to focus on the things that I can’t change and focus on the things that have gone well for me”. When discussing her personal goals for state she told us, “For me, a personal goal is to just do better than last year, even if it’s by one point. As our coach always says, ‘Your biggest competition is yourself ‘, so I want to do better than last year. Another goal is to just have fun and make my last state meet the best one”. Come out to cheer on the Lady Water Warriors at their final high school swim meet this Friday and Saturday at the Veterans Memorial Aquatics Center. Swim Prelims are on Friday at 10am and Dive Prelims are on Saturday at 9am. Finals are on Saturday at 3:30pm. GO WARRIORS!